← Some snippets from today’s reading. Of all the aspects of the Christian life, one of the most elusive is that of achieving balance or proportion. We tend to have certain emphases which define us. One way we see can see that in ourselves – is when we stop and think about the attributes of God. Which attribute or aspect of God stands out to you the most? Sovereignty? Holiness? Righteousness? Mercy? Grace? Omniscience? Justice? Love? If you place any one of God’s attributes above the others so that it diminishes any another, you end up with a distorted God, one who is disproportionately one way or the other. So some emphasize God’s mercy and love to such a degree, that they no longer have a place for His justice and hatred of sin. Or one can so emphasize God’s holiness and righteousness as to all but eliminate His mercy and grace. But here’s the deal with light – It is one thing when seen whole with everything in balance, and another when refracted. No one part of the spectrum is meant to be the entirety of light. All must be taken in in perfect proportion for us to have white light. No one quality can dominate. Christians are meant to be REFLECTORS of God’s glory, not REFRACTORS. We were created to reflect His glory, to bear Christ’s image as it is, and not just the parts we like best or most admire, identify with or that others find most acceptable. 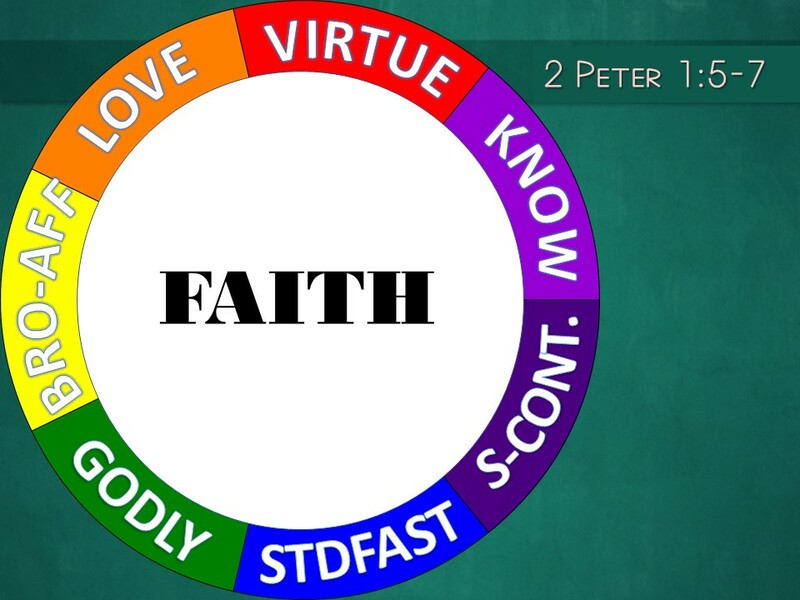 Bring that to bear on the text before us today, Peter’s idea here is that in each case, faith – as the core of the Believer’s life, must be supplemented by these other things in order to be whole and balanced. If we are to bear Christ’s image in an undistorted fashion, the way He revealed the Father – then we must supplement the base faith we have, with those things which bring the whole into proper proportion. Remember 2 weeks ago? We looked at the larger context here and saw 3 Promise/Problems that Peter was wanting to help Believers avoid. Promise: We can be both effective and fruitful in the knowledge of Christ Jesus. Promise: We can live lives where sin is regularly overcome. Promise: The Believer can have a RICH entrance into the eternal kingdom. How does this happen? This is what Peter unfolds in vss. 5-7 – and as we shall see, each “quality” Peter notes, speaks to a specific danger as well. And as we unpack these, we can easily see how each contributes to the whole in keeping the Christian life well-rounded, proportionate and well-balanced. Complete. Now no one disputes the fact that the Christian life begins with FAITH. No one is a “Christian” apart from having believed the Gospel. Having believed – on the basis of God’s Word, that we were sinners separated from God by our rebellion against His absolute right to rule in our lives; and that God sent His Son, Jesus Christ to die in the place of sinners, to make a full atonement for sin; – announcing to all that would hear, that they can be forgiven, restored to right relationship with God, become partakers of the divine nature, and adopted into His family by trusting Christ’s sacrifice on their behalf – turning to Jesus and away from their sin. This is the essence of saving faith. Just as being physically born is only the start of living life as a human being, being born again is only the start of the Christian life. 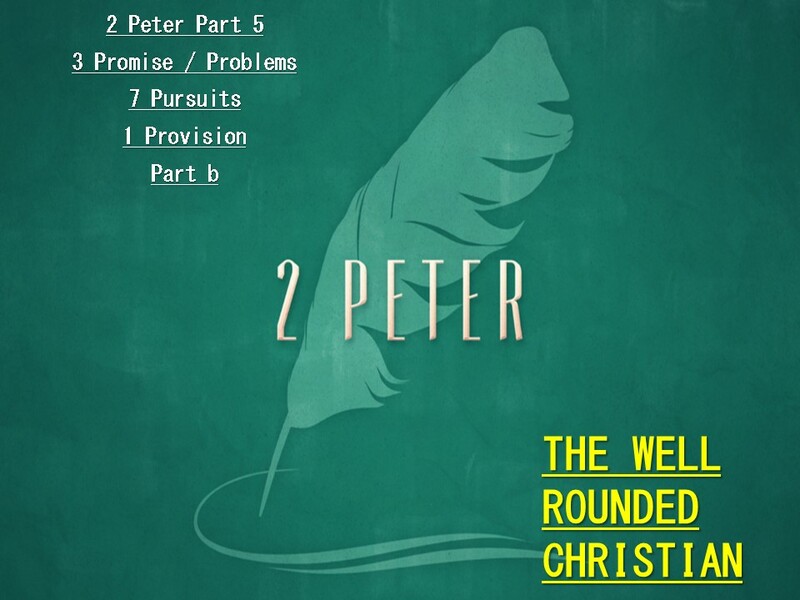 So Peter goes on to identify the key things that make for the healthy, well-rounded Christian life. 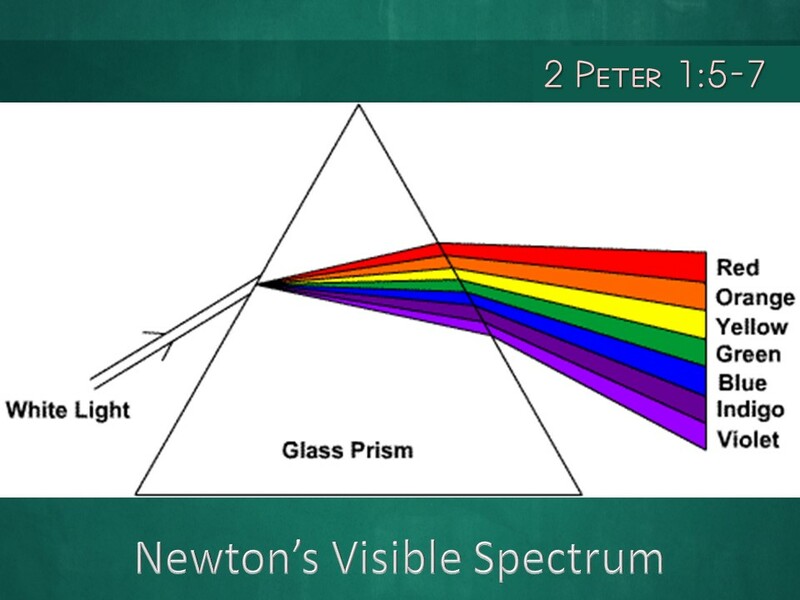 Using Newton’s 7 part idea of the visible spectrum we saw earlier – it can serve as an illustration of how we make Christ visible to the world through REFLECTION – perhaps, reverse refraction. Danger 1: Faith that goes no further – that never matures. Virtue is not a word we use a lot today in this way. Some translations prefer “excellence” and that may be closer to Peter’s idea. So the Believers are to go beyond merely believing, to living the life we were created for – to bear the image of Christ. Colossians 3:9–10 Do not lie to one another, seeing that you have put off the old self with its practices 10 and have put on the new self, which is being renewed in knowledge after the image of its creator. It is human nature to seek to be like those we admire. But many of us fail to admire Christ in a way that is useful, because we do not regard His humanity enough. We’ve distorted the balance between His divinity and His humanity. We read the Gospels and treat Him as though He was walking deity, but not truly human, depending upon the Spirit the way we are called to do. We make Him too mystical, and almost mythical. But He walked here as a man, humbled like us. That we might also look to Him, and set our feet following Him – not in our own strength as though imitating Him saves us, but as having become partakers of the Divine nature, having been justified by grace and indwelt by His Spirit, setting out to walk as He did. Because that is what He fully intends to bring us to. Supplement your faith with VIRTUE – Excellence. Danger 2: Faith that rests only in feeling or intuition. There are many zealous, religious persons, who have no real knowledge of God’s truth, and whose zeal in the end will add up to nothing. And even Christians who are truly born again, but live their lives on mere impulses and ill-informed ideas of what God is doing and desires – can live in a fruitless little shell of their own making. Danger 3: Faith that confuses knowledge for spiritual growth. This is a special danger to the studious and thoughtful among us. It is a great gift to have a mind that loves theology and to dig into the Word and the deep mysteries of God. But when that digging and study is not paired with a lifestyle of dealing with sin and the inward and outward workings of our sinful natures – a disaster is at hand. One of the true Biblical geniuses of our generation was George Eldon Ladd. A theological giant, whose works have benefitted me and countless others. But the sad tragedy of his personal life due to alcohol abuse and an apparent unawareness of how pride and needing scholastic affirmation drove him – is heartbreaking in the least. Theological giant Arthur Pink serves as another warning. I wish I could not affirm it, but I’ve met too many sharp theological minds who have ruined themselves for service to the kingdom and the cause of Christ because they never spent any real energy in examining their own hearts and minds by the light of the Word and the Spirit, so as to live under His divinely granted self-control. Danger 4: Faith that only operates in fits and spurts, when one feels like it. Steadfastness has to do with endurance. Bearing up under pressures and trials and difficulties. Sticking to the course when there is opposition and distraction – both from without and from within. It is the opposite of being a Sunny Day Friend. Loving and serving and seeking Christ when things are going well, and withdrawing and serving Him punitively when things are hard. Many start out on the road in Christ, but many end up falling away, turning back or just quitting – for whatever reasons. But it is the one who remains steadfast who receives the promises. Israel’s 40 years in the desert is a prime example of how so many can start well – while only 2 of the original ones delivered from Egypt actually entered in. Aristotle said that self-control has to do with dealing with pleasures, but that steadfastness or endurance had to do with putting up with sorrows and hardships. Danger 5: Faith that disregards any authority above self. Unsubmitted. The word used here has to do with respect and reverence. First for God and His Word and the way He has ordered things, and then for those made in His image. The Godly have no room for maligning or disdaining others – or for being lone-rangers without respect for God’s institutions and arrangements. As we’ll see in the next chapter, False Teachers err especially here, speaking ill of those God has put in authority in the Church and in the world, and having more concern over their “ministries” than the people they supposedly minister to. Danger 6: Faith that exists in isolation – never blessing others. Those without brotherly affection think only in terms of how the Church and others might serve them or be a platform for their gifts – and not how they can be most useful for others in the cause of Christ. Often they become isolated. They imagine they can be fine Christians all by themselves. If they seldom or never go to Church – so what? They have Christ (or so they suppose) and that’s enough. Whether or not they extend the love of Christ to anyone else in any tangible way is ultimately irrelevant to them. They’ve privatized it all so that they never have to deal with anyone else’s rough edges, those who might disagree with them over some issue, or especially have to forgive anything. They want to be left alone and unruffled. Danger 7: Faith that that only thinks and doesn’t feel. Mere rote disciplines or practices, no matter how well rooted in God’s Word, mean nothing if love for Christ and those around us is not at the very bottom of it all. This was Jesus’ rebuke to the Church in Ephesus in Rev. 3. They were doctrinally sound and defenders of the faith, but they had lost their “first love.” Dispassionate duty became the sum of their Christian walk. Michael Green, 2 Peter and Jude: An Introduction and Commentary, vol. 18, Tyndale New Testament Commentaries (Downers Grove, IL: InterVarsity Press, 1987), 85. No one can follow Him without actually doing it! Acting. Exerting effort. It cannot be done passively. Though the power to do so is given sovereignly. But whom He calls, He empowers. So our text – we have become partakers of the divine nature – so that we might be able to supplement our faith accordingly. And as the exhortation is here: “make every effort” in supplementing our faith with these necessary things. This is not about having some one-time experience. These qualities are to be ours – but they are to be INCREASING. No one ever “arrives” while we are still in this life. Excellence – Knowledge – Self-Control – Steadfastness – Godliness – Brotherly Affection or Love. This is a perpetual new lifestyle in following Christ. GRANTED: 2 Peter 1:3–4 “His divine power has granted to us all things that pertain to life and godliness, through the knowledge of him who called us to his own glory and excellence, 4 by which he has granted to us his precious and very great promises, so that through them you may become partakers of the divine nature, having escaped from the corruption that is in the world because of sinful desire. The pursuit of these MUST be done only by the means He has provided for us in grasping the reality and power of the indwelling Spirit of Christ. Due to the noetic effects of sin, we need to be reminded of these over and over and over again. It is one of the chief tasks of those who preach and teach to constantly remind the Church of these things, and it is incumbent upon us as individuals to remind ourselves over and over lest we let them go by the wayside. Reflecting His Glory – not refracting it. Michael Green, 2 Peter and Jude: An Introduction and Commentary, vol. 18, Tyndale New Testament Commentaries (Downers Grove, IL: InterVarsity Press, 1987), 84.